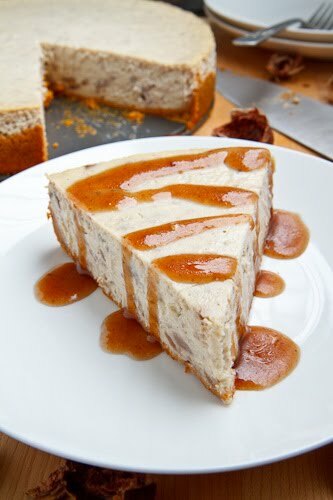 A creamy chestnut cheesecake that is perfect for any special occasion. The final component of my Thanksgiving dinner was of course the dessert! Normally when I am thinking about a dessert for Thanksgiving I head toward pumpkin or sometimes even sweet potato but this year I wanted to try something new and I went with another great fall ingredient, the chestnut. 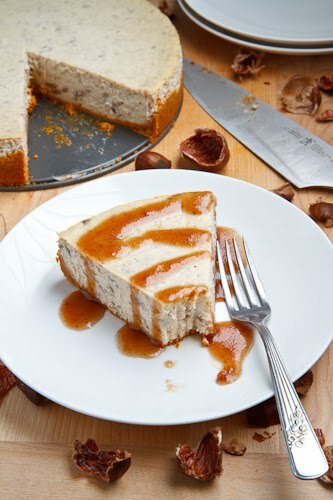 I don’t use chestnuts nearly enough and I was thinking that a chestnut cheesecake would be a perfect way to end my Thanksgiving feast! 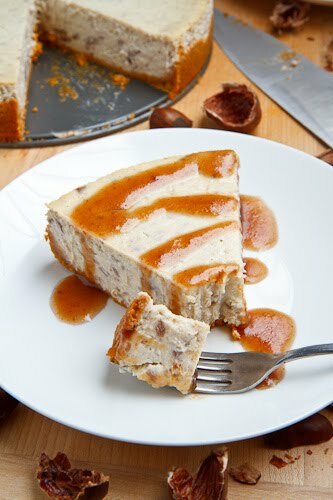 After looking around for a while I settled on this recipe for a chestnut cheesecake that is topped with a rum-y syrup. 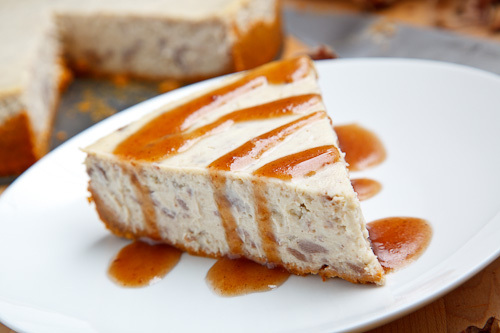 Overall this recipe is pretty standard for a cheesecake and it is actually quite easy to make. You basically just press the crumb crust into a pan, mix all of the filling ingredients, pour the mixture into the pan and bake it. This recipe uses a hot water bath to help ensure that the top does not crack but you could skip this part if you prefer. You could use canned chestnut puree or if you have the time it is pretty easy to make your own. Process the Graham cracker crumbs, butter, chestnut puree and sugar in a food processor until it form small crumbs. Press the crumbs into the bottom of a 9 inch spring form pan and place it in the fridge. Beat the cream cheese and sugar until smooth. Beat in the eggs and egg yolks one at a time until incorporated. Add the sour cream, lime juice, vanilla extract and rum and beat until smooth. Double wrap the bottom of the spring-from pan with foil, place it in an oven safe pan and pour recently boiled water into the into the pan so that it goes one inch up the foil wrapping. Bake in a preheated 350F/180C oven until there is just a small wobble in the middle when shaken, about an hour. Let cool, remove the foil, cover in plastic and place in the fridge over night. Place the water, rum, chestnut puree, sugar and butter in a small sauce pan, simmer for 10 minutes and let cool a bit before drizzling over the cheese cake. my goodness what a great idea to use chestnut. have i ever baked with chestnut before? noooo, but i so need to when it's in cheesecake form. I am so in love with this. I love that the chestnuts are in every component! this is just the kind of crazy unique dessert that I need to serve at my Thanksgiving dinner! I've never baked or cooked with chestnuts before! Yum! you just reminded me I have cups for of chesnut puree in my freezer! yeah for me. an interesting way to serve the classical english choice! Mmmhhh, that is a fabulous flavor! Irresistible. I think that I will have to make this for Thanksgiving! What a wonderful recipe. Thank you! How does it taste chestnuts ? Okay, Kevin, I'll admit that I am discovering your Thanksgiving menu from dessert on backwards but oh what a dessert! I agree about always turning to pumpkin, sweet potato or even apple and chestnut is fabulous! I did a couple chestnut desserts last year. 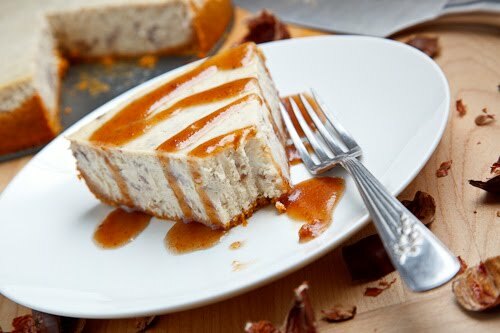 This cheesecake is gorgeous! Now I want to try, too, and I happen to have both canned purée and cooked vacuum packed. Delicious! this is so unusual, I must try it!! Kevin, what a trendy idea! Thanks for including the link to your "old" Chestnut Puree recipe. What milk are you using with it these days… whole, 2%, 1%, skim, or does it matter? I was even wondering about coconut milk, if that would work. Wow! This looks incredible! I absolutely love chestnuts and start to feast on them once they get into stores in the fall. I'll have to try this! Kathleen Richardson: Any milk will work and I usually use 2%. Now that is a flavor you don't see much of…but wow and yum! this is very interesting…I've had many cheesecakes before but never chestnut. I just recently made an anise plum jam/preserve to top regular cheesecake. It's so good – my dad can't get enough. Can you buy chestnut puree?? Stinkybabysmom: Yes you can buy chestnut puree and you should be able to find cans of it in larger grocery stores and import food stores. Bea Long: I have not tried using candied chestnuts to make the puree but they would be good and a blender should be able to puree them. You may nee to soak or even boil them a bit first depending on how hard they are. Enjoy! I have some chestnuts left over from a Valentine's recipe I created for my blog and I wasn't quite sure what to do with them, other than sit and eat them out of the tin! Cheesecake sounds like a great idea. Just tried this wonderful recipe. Fabulous. Thank you so much!! !